Kambei is relaxed, happy and laid-back. He is a musician, playing more instruments than he has fingers, and is a natural stage performer, actor, and diplomat. He is highly intelligent, analytical and wise, but has an arrogant and self-righteous streak. To be sure, he is a good man with a strict code of conduct for himself based on honor, loyalty, and compassion, but he can be a harsh judge of those that hurt others, intentionally or accidentally. He absolutely hates fighting, even though he is almost insanely skilled. 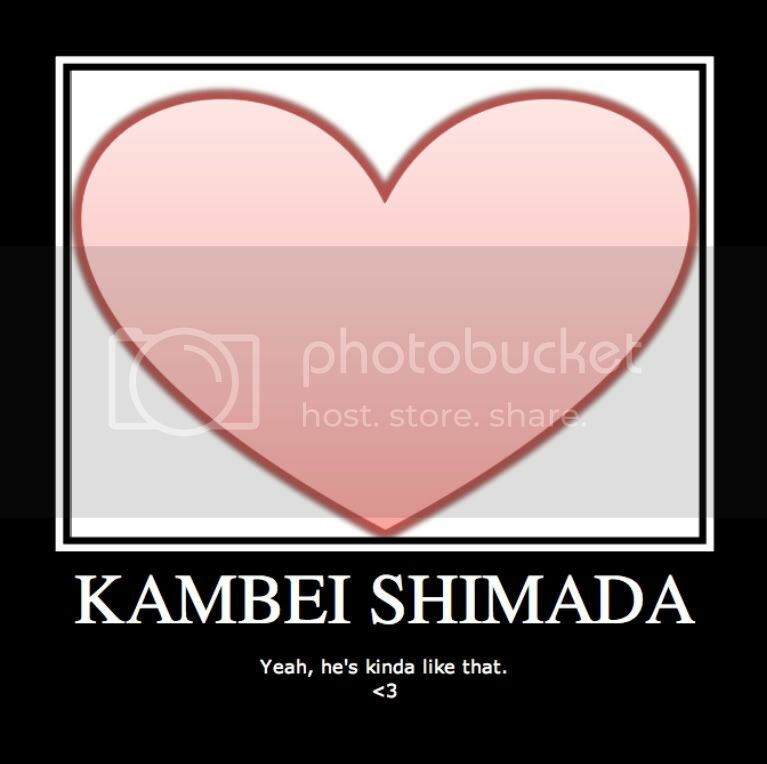 Kambei wears the normal captain's shinigami robes, though he isn't a captain. He was formally the captain of one of the squads, though he intentionally refuses to say which he was captain of. He carries a katana on each hip, and has small silver glasses that are slightly bent. His brown hair is short and neatly combed, and he has dark, liquid brown eyes. He sports three brown freckles in the shape of a right triangle on his left cheek, and the pattern is repeated on his neck, in exactly the same way. Devotion represents just that: Devotion. It is quieter, calmer and more obedient than The Nameless, as well as far more powerful. A glowing human-shaped form that towers over Kambei. A 3 foot long katana with a black handle and gold-wrapped hilt. Shikai: "Spread your wings, Devotion." Kambei gains two white wings that allow him to fly at great speed. He can summon up to 20 golden shields made of reiatsu that can each take 2-3 cero before dissolving. He can also create huge barriers of reiatsu, provided he only as 15 or less shields created at the moment. These huge barriers are impenetrable except for nearly 6 cero, but require great concentration and effort. Bankai: "Cut Their Wings, Devotion." Kambei grows another pair of wings, totaling four wings. His eyes are covered by a golden blindfold which allows him to see through all illusions. Devotion extends to a katana four feet long. In this form, Kambei can summon up to 40 shields that each take 4 cero to destroy, or 8 huge shields that take 12 cero to destroy. He also gains a visible aura of reiatsu that serves as a personal barrier, acting like an arrancar's Hierro. He can use these shields to crush, suffocate, or pin down his enemies, or even to hold him up in the air. 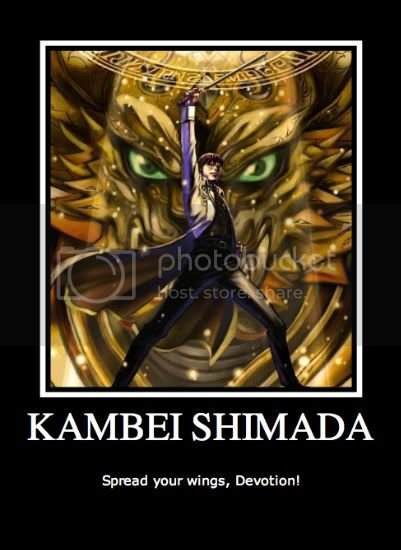 He can also fire beams of golden reiatsu that heal whatever they hit.